Anna Konik, Play Back (of Irène), 2009, fifteen-channel video, color, sound, 2 minutes 58 seconds. Installation view. Anna Konik’s work operates within the psychological states of the afflicted: Refugees, schizophrenics, the elderly, and the infirm are all subjects of her video installations. Konik interprets their stories through fragmented, multichannel constructions where each part provides a different glimpse into the narrative. Shifts between abstraction and representation—and an indeterminate line between the real and the fictional—increase the dramatic tension. Our Lady’s Forever, 2007, for instance, is a seven-channel work shot in a defunct mental institution featuring footage of an electric fan; on the opposite wall in the gallery, a real curtain billows. The monumental projection of The Villa of the Entranced, 2009, presents a villa in crisp focus while smaller elements projected onto four screens nearby are blurred beyond recognition. The women speaking to the camera in In the Same City, Under the Same Sky . . . , 2011–15, provide first-person testimonies of the hardship and injustice borne by immigrants, but they are actors. Despite the intense subject matter, these videos feel calm. With slow pans over a mountain, dangling ropes, and a woman, Play Back (of Irène), 2009, reconstructs the experience of falling from a cliff. 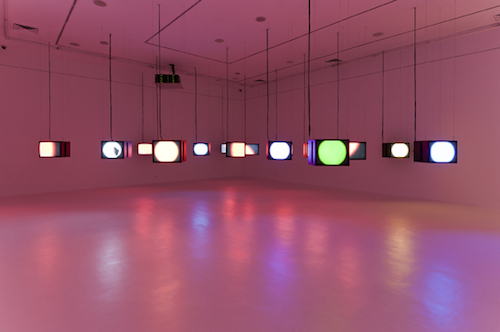 Fifteen monitors are suspended from the ceiling at the eye level of the video’s protagonist, but their arrangement in the space obscures a direct view; from no vantage can the viewer observe all of them at once. Making the narrative even more elusive, the black-and-white images periodically dissolve into circles of bright color, like a vivid dream recalled at the moment it slips away.